A real-world study of a panel of small retail outlets by our group aimed to investigate this claim. We found only a small, temporary increase in cigarette pack retrieval times immediately following plain packaging implementation on 1 December 2012.4 By the second week of December 2012, pack retrieval times had returned to levels that were no different to baseline months, as was the case for February 2013. Television advertisements, packaging regulations and health warning labels (HWLs) are designed to communicate anti-smoking messages to large number of smokers. However, only a few studies have examined how high smoking prevalence groups respond to these warnings. This study explored how socioeconomically disadvantaged smokers engage with health risk and cessation benefit messages. Six focus groups were conducted over September 2012–April 2013 with adult clients of welfare organizations in regional New South Wales, Australia who were current smokers (n = 51). Participants discussed HWLs, plain packaging and anti-smoking television advertisements. Discussions were audio-taped, transcribed verbatim and analysed using thematic analysis. Highly emotive warnings delivering messages of negative health effects were most likely to capture the attention of the study participants; however, these warning messages did not prompt quit attempts and participants were sceptical about the effectiveness of cessation programmes such as telephone quitlines. Active avoidance of health warning messages was common, and many expressed false and self-exempting beliefs towards the harms of tobacco. Careful consideration of message content and medium is required to communicate the anti-smoking message to disadvantaged smokers who consider themselves desensitized to warnings. Health communication strategies should continue to address false beliefs about smoking and educate on cessation services that are currently underutilized. The aim of the present study was to assess smokers’ level of agreement with smoking-related risks and toxic tobacco constituents relative to inclusion of these topics on health warning labels (HWLs). 1000 adult smokers were interviewed between 2012 and 2013 from online consumer panels of adult smokers from each of the three countries: Australia (AU), Canada (CA) and Mexico (MX). Generalized estimating equation models were estimated to compare agreement with smoking-related risks and toxic tobacco constituents. For disease outcomes described on HWLs across all three countries, there were few statistical differences in agreement with health outcomes (e.g. emphysema and heart attack). By contrast, increases in agreement where the HWLs were revised or introduced on HWLs for the first time (e.g. blindness in AU and CA, bladder cancer in CA). Similarly, samples from countries that have specific health content or toxic constituents on HWLs showed higher agreement for that particular disease or toxin than countries without (e.g. higher agreement for gangrene and blindness in AU, higher agreement for bladder cancer and all toxic constituents except nitrosamines and radioactive polonium in CA). Pictorial HWL content is associated with greater awareness of smoking-related risks and toxic tobacco constituents. Background Passive exposure to combustible cigarette use has been shown to act as a cue to increase smoking urge. Given the resemblance of e-cigarettes and other electronic nicotine delivery systems (ENDS) to combustible cigarettes, we examined whether these devices could also act as a cue to increase smoking desire and urges in those passively exposed. Methods Young adult daily smokers (age 18–35 years; N=60) completed subjective ratings before and after exposure to a study confederate drinking bottled water (control cue) and then smoking either a combustible or e-cigarette (active cue). Smoking desire and urge ratings were measured with visual analogue scale items for desire for a regular and an e-cigarette and the Brief Questionnaire of Smoking Urges. Results Passive exposure to both the e-cigarette and combustible cigarette cue significantly increased observers’ ratings of desire and urge to smoke a regular cigarette (all ps<0.05). Exposure to the e-cigarette cue but not the regular cigarette cue also increased desire to smoke an e-cigarette (p<0.01). Conclusions The results provide the first evidence in a controlled setting that electronic cigarette exposure may evoke smoking urges in young adult daily smokers. With replication, these findings may have relevance for ENDS regulation and policy. The final version of the Tobacco Product Directive (TPD), a new law that strengthens the rules on how tobacco products are manufactured, produced and marketed in the EU, has just come into force. With the European Parliament elections approaching we look back at the lobbying battle around the TPD and provide, for the first time, online access to (parts of) tobacco giant Philip Morris’ leaked lobby strategy documents. We also offer a list of the ten MEPs from the current Parliament who have – according to the leaked documents – the strongest relations to Philip Morris. The unease among MEPs further increased in September last year when internal documents of the tobacco giant Philip Morris leaked. The Guardian newspaper was the first to report on the leak, which showed that the company had (undisclosed) lobby meetings with no less than 233 MEPs. At least 161 of the company’s staff were involved in this lobbying offensive, the newspaper reported. The European media including Der Spiegel and Le Parisien reported extensively about the leaked documents which outline the lobbying strategies and activities of tobacco giant Philip Morris International to attempt to influence the European Parliament’s decision-making on the TPD. The revelations sparked angry reactions from MEPs, such Karl-Heinz Florenz, a Christian Democrat MEP, who condemned the lobbying methods as “leprosy for democracy”. Many MEPs who supported strong tobacco regulation criticised colleagues for their meetings with Philip Morris’ lobbyists and for being too close to big tobacco. Showing what they were up against, the leak stiffened the resolve among pro-regulation MEPs to protect the TPD from being sabotaged by tobacco industry lobbyists. The leak (which consists of hundreds of pages of documents, compiled in two large pdf files) gives a unique insight into the lobbying strategy of a large multinational company. Some of the files outline PMI’s lobbying strategy towards the European Commission (see TobaccoTactics for a summary of these efforts). The tobacco giant maintained lists of every single Member of European Parliament (MEP) and their views on tobacco regulation, featuring explanatory comments by MEP’s names such as: “Very supportive – receptive to nanny state arguments”, or, “wishes not to meet PMB [Philip Morris Benelux] but is supportive of PM views”. This allows Philip Morris International (PMI) to build up a comprehensive picture of the political support they enjoy, as well as to target MEPs to apply tactical pressure. 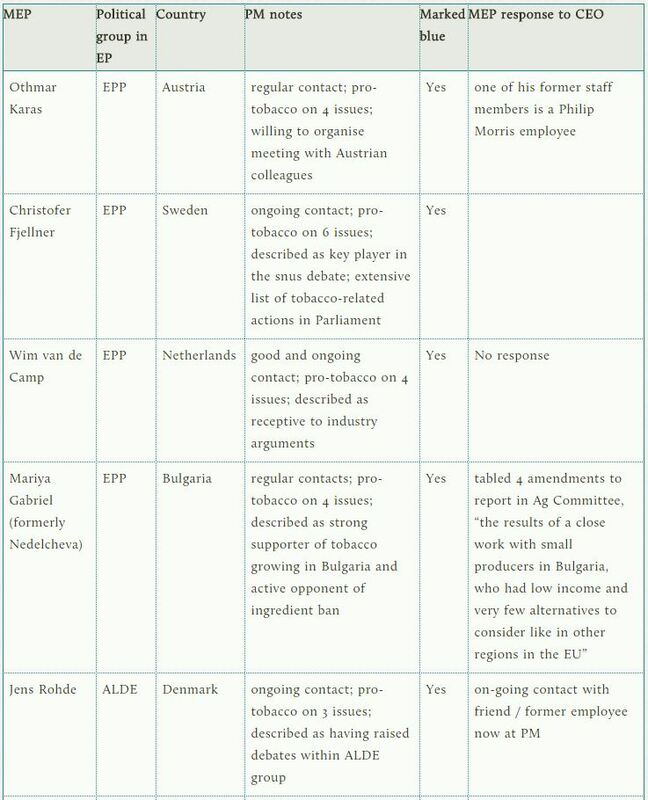 The leaked files also document how Philip Morris monitors not just friendly allies but potential enemies, for instance saying of one MEP: “Fervent opponent to tobacco industry – Necessity to monitor closely her potential anti-tobacco initiatives – do not want to meet the industry.” Though mostly focused on tobacco issues, many comments also focus on personal information about MEPs that might be useful when lobbying. One MEP is mentioned as being “keen on motorcycling”, another MEP, the files state, “is becoming rather impredictable [sic]”. It also mentions examples of MEPs who are said to have unfriendly relations. Crucially, the files show just how comprehensive Philip Morris’ access to MEPs is. We are providing excel versions of a relevant sample of the leaked documents. This involved processing the PDFs with a special program. Therefore, in some cases characters could not be recognized, and these are marked with [Ill.] or [Illegible] within the spreadsheet cells. You can download three Excel files, which represent the essence of the ‘MEPs Influenced’ document. The central file is ‘Friday List June 22nd’, which features all MEPs and their opinions on tobacco issues and if they have met Philipp Morris representatives. ‘ENVI MEPs’ is a list on most of the Full members of the ENVI committee including details on them. The ‘Country Documents’ file is a compiled version of all existing single country lists footnotes on the respective countries, in alphabetical order. Note that these leaked documents do not contain lists of MEPs for all EU countries, nor are they up-to-date – most of the documents date from June 2012, some are from the end of 2011. Yet they are singular in the insights they lend us into the Brussels lobbying activities of Philip Morris. The leaks featured here consist of two big documents. The ‘MEPs Influenced’ document summarises the activities of the lobbyists and the opinions of the Members of the European (MEPs) Parliament on different tobacco regulation issues. It also includes more detailed reports on the MEPs of most of the European countries, including footnotes on each member. The other part of the leak is the ‘Strategy Document”, which we quote from further down. Altogether the documents seen by the author make up more than 400 pages. The tobacco lobbyists use a colour scheme to show the opinions of all MEPs on six key issues. Green means positive for the tobacco industry, red means negative. The key issues are Generic Packaging [GP], Expanded Health Warnings [EHW], Ingredients Ban [IB], Point of Sales Display Ban [POSDB], New Generation Products [NGP] and Snus. The latter refers to tobacco taken directly into the mouth in small pouches, which is only legal in Sweden. Snus was the central issue in the Dalligate scandal, where Health Commissioner John Dalli was forced to resign over yet-to-be-clarified tobacco lobbyists’ contacts. In February 2009 the European Commission announced that it wanted to revise the original Tobacco Product Directive of 2001. The Commission explained this revision saying there were new products not covered by the original Directive. Also, new scientific evidence suggested consumers might be misled by the tar and nicotine levels on cigarette packages. The main goal of the new rules was to reduce the number of young people who start smoking and develop a deadly addiction. The Commission faced heavy pressure from Philip Morris and other tobacco companies, which may have contributed to a weakening of the proposal for a revised Directive presented by the Commission in December 2012. The European Commission did not propose plain packaging, but argued for health warnings making up at least 75 per cent of the back and front of boxes (EHW), a ban on strong flavours such as Menthol (IB), banning cigarettes from the displays in shops (POSDB) and regulating e-cigarettes and other new products (NGP)1. A synopsis of the different lists created for this article shows that Philip Morris International identified almost 130 MEPs that supported the company’s position on not expanding health warnings on the packaging. In contrast, slightly more than 40 MEPs were against the tobacco industry’s plans. Please keep in mind that this represents the state of play in mid 2012 – a lot of lobbying on both sides occurred thereafter – and that this is Philip Morris’ interpretation of the views of MEPs. Philip Morris lists 160 MEPs as being opposed to plain packaging and 33 in favour of it. 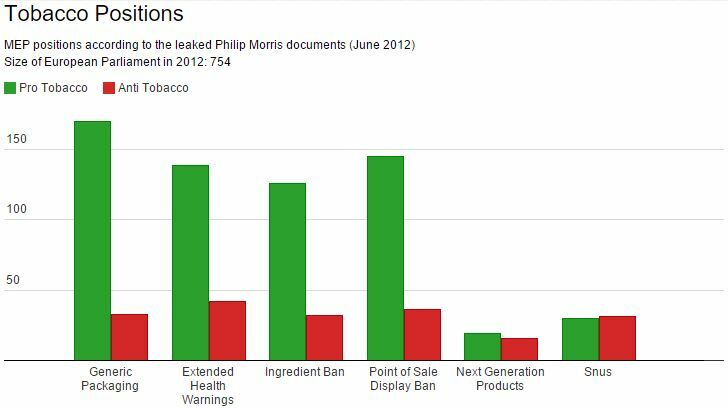 On the topic of banning certain ingredients, Philip Morris found 119 MEPs opposed, whereas 32 MEPs wanted stronger regulation. According to the lists, just over 170 MEPs had an opinion on making tobacco products “under the counter” items (POSDB). This would mean showing tobacco products only if customers asked for them. The majority of the MEPs – 135 – opposed such a measure. Beyond mapping the opinions of and gathering information on as many MEPs as possible, Philip Morris had a strong focus on addressing members in influential positions. These members sat on the two main committees which dealt with the Tobacco Directive. The core committee was the one on Environment, Public Health and Food Safety (ENVI). The committees on Internal Market and Consumer Protection (IMCO) and Legal Affairs (JURI) were also assessed and mapped in great detail. 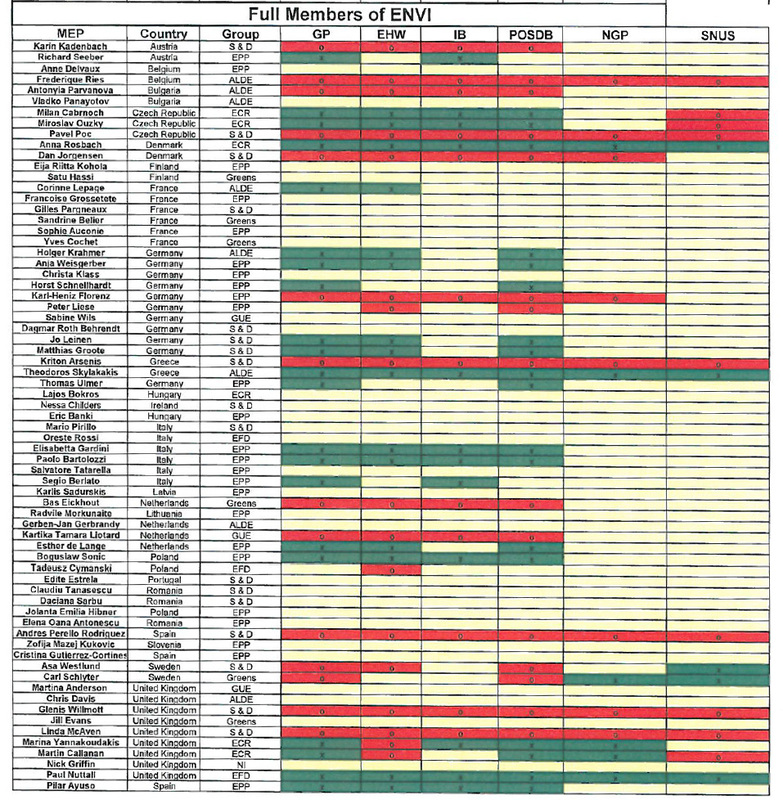 Philip Morris documents its contact with all members of the ENVI committee in a separate file [ENVI MEPs], targeting the key players who could be amenable to their arguments. They also looked at which positions the committee members might have taken in the past. The members are prioritised into the groups “High”, “Medium” and “Low”. High usually means that a MEP is in a relevant committee or in another key position such as being the country delegation leader or strong player within the parliamentary group. Secondly, the label “High” means the MEP is open to the tobacco industry’s arguments. This tends to be the case more among members of EPP, ALDE and conservative groups. In some cases MEPs are also targeted as high if they take a dedicated anti-tobacco position. Members of Parliament which are in relevant committees but are not in key positions receive a “Medium”. At the time of the making of these documents (mid 2012), the lobbyists had met more than 30 of the 65 members of this committee. We have compiled a list of the ten MEPs with the strongest relations to Philip Morris according to these lists. These parliamentarians are labelled as having “ongoing”, “regular” or “continuous” contact in the list or a history of several meetings with Philip Morris lobbyists. They are marked as “High” priority. All take pro-tobacco positions; seven of them are also marked blue for being targetable with industry arguments. PM’s further notes explain their role. The MEPs only responded to our queries in part. Interestingly, two mentioned that former employees of theirs were now working for Philip Morris. Othmar Karas replied that one of his former staff members was a Philip Morris employee, which might explain why the contact is labeled “regular”. Jens Rohde explained that he has “on-going contact with Anne Katrine Melvig due to the fact that she is a very good friend of mine and a former employee, who worked for me during the time I was a Member of the Danish Parliament”. As a point of clarification Indrek Tarand answered that he was not a friend of Philip Morris even though being a smoker: “I am against big tobacco companies,” he said. In his case it is especially unclear how Philip Morris came to a conclusion about his positions on tobacco. It is possible that Philip Morris’ employees used the term “ongoing contact” in different ways depending on the country. None of the MEPs were aware that Philip Morris was collecting information on them. It is unclear how PMI gathered information on the positions all the parliamentarians on the list held. In some cases no direct contact is mentioned, yet the MEP appears to be marked as positive on several issues. In some cases meetings might not have been necessary because the relationship was already very good, in others it still had to be strengthened. One explanation could be that Philip Morris’ employees were keen on demonstrating their efforts and claimed having had a meeting when they might have just had a short encounter. After all, these lists may also function as an internal competition to show which division is doing the best lobbying job. Many of the contacts are specified as “informal” in the spreadsheets. Such undisclosed meetings are clearly against Article 5.3 of the World Health Organisation (WHO) Framework Convention on Tobacco Control which calls for contacts between industry and lawmakers to be limited to the strictly necessary and these to be conducted in a completely transparent manner. The records of such interactions must be publicly available. As the overwhelming majority of MEPs do not presently adhere these requirements, Corporate Europe Observatory and a dozen other NGOs wrote to the President of the European Parliament Martin Schulz in October 2013 to insist that transparency rules for contacts between MEPs and tobacco lobbyists should be established. Schulz argued that the WHO rules were not binding and that it was sufficient to rely on the “self-responsibility which comes with a free parliamentary mandate”. The Greens as well as individual MEPs from different political groups follow these guidelines in an exemplary way, but most MEPs’ relations with the tobacco lobby completely remain opaque. Philip Morris used delegating to other committees partly as a delaying tactic and partly in the hope other committees would be more sympathetic to the company’s point of view. The approach showed some success: Klaus-Heiner Lehne (EPP) became the rapporteur for the legal affairs committee (JURI) and appears to have been a high-priority target of Philip Morris, with regular contacts dating back until 2008. Lehne was well suited for this as a long-time member of the European Parliament with a wide contact network and was a partner in a law firm which happens to represent Japan Tobacco International. Lehne did not see a conflict of interest in this. In April 2013, Lehne delivered JURI’s opinion on the Tobacco Directive, suggesting a watered-down version with just 50 per cent of the package’s back and front containing warnings and cancelling the option of member states to introduce plain packaging. However, the final version of the Tobacco Product Directive still contains the member state option and reserves 65 per cent of the package’s back and front for warnings. Lehne has since left the European Parliament and become part of the EU’s Court of Auditors. One more conclusion that appears from the documents is the strong imbalance in terms of human resources: just one tobacco company, Philip Morris, operated with a large number of staff – the list of consultants (‘New Transparency Register’) in the leaked document contains more than 160 persons, another one features almost 40 key staff members in charge of lobbying one or more countries. These activities are in strong contrast to Philip Morris’s officially declared number of lobbyists in the EU Transparency Register, which lists just seven names of PMI lobbyists. PMI, in its entry in the register, claims that the amount of time spent on lobbying by PMI employees equals nine full-time lobbyists. Corporate Europe Observatory last October filed a complaint against Philip Morris for under-reporting on its lobbying expenses and the number of lobbyists employed, but – disappointingly – the Transparency Register failed to seriously investigate the obvious mismatch between the information in the leaked documents and PMI’s entry in the register.3 This also highlights another failing of the Transparency Register, in that one cannot consult records for previous years. The Tobacco Products Directive is now in force. Given that at some stages health professionals were afraid the Directive might not be passed before the EU elections or might even get killed off totally, this is good news. It demonstrates that even powerful lobbyists like the tobacco industry are not able to get all they want. Although the leak of the Philip Morris lobby strategy helped reinforce the resolve of MEPs opposed to big tobacco, we do not know how its lobbying may also have influenced the European Parliament to weaken the proposal drafted by the European Commission on several key points. The size of health warnings on the packaging was reduced; the proposed ban on misleading ‘slim’ cigarettes was cancelled, to mention just two examples. The final outcome is an improvement compared to the existing rules, but considering the deadly impacts of smoking much more could and should have been achieved. Examining these documents clearly shows that the European Parliament needs to evaluate how to protect itself better from undue influence from the tobacco industry. The absence of rules or guidelines for MEPs made it very easy for Philip Morris and other tobacco companies to covertly lobby and influence MEPs. The UN rules state very clearly that contacts with lobbyists should be limited to a minimum and all meetings that happen must be documented and published. However the European Parliament has failed to take any collective measures towards implementing this. Presently, big companies such as Philip Morris can play out their lobbying power in terms of money and staff without citizens being able to find out. 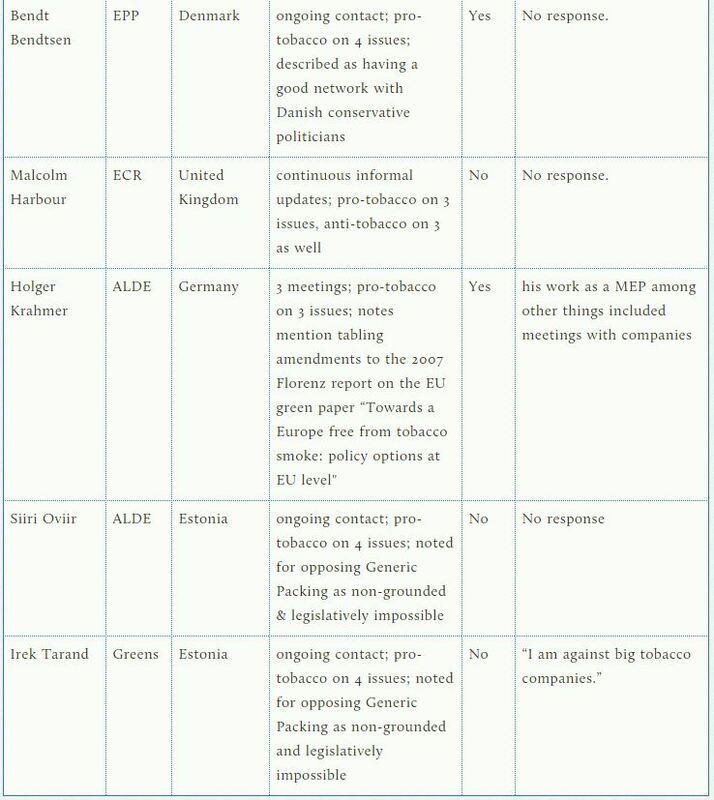 The leaked files also reveal that far too many MEPs are too close and too friendly with the tobacco industry. The lesson for the European Parliament elections is that Europe needs MEPs who can stand-up for the public interest, against the lobbying of the tobacco industry. 3. CEO filed a complaint with a detailed argumentation on October 8th 2013. We suggested the Transparency Register secretariat ask Philip Morris to show them the leaked files and offered to help the secretariat get access to the leaked documents in case PMI refused to do so, an offer that was not taken up. The secretariat met with PMI, but appears to have taken a very soft approach towards the tobacco giant. On 20 December PMI updated its entry in the Transparency Register without changing anything about the numbers of lobbyists or lobby expenses. Only the list of issues lobbied on was expanded. This paper presents the final results of a cross-sectional study started in 2010. It compares the perceived efficacy of different types of tobacco health warning (texts versus shocking pictures) to quit or reduce tobacco use. The study conducted between 2010 and 2012 in Italy enrolled adults smokers. Administering a questionnaire demographic data, smokers behaviors were collected. Showing text and graphic warnings (the corpse of a smoker, diseased lungs, etc.) the most perceived efficacy to reduce tobacco consumption or to encourage was quit. 666 subjects were interviewed; 6% of responders referred that they stopped smoking at least one month due to the textual warnings. The 81% of the smokers perceived that the warnings with shocking pictures are more effective in reducing/quitting tobacco consumption than text-only warnings. The younger group (<45 years), who are more motivated to quit (Mondor’s score ≥ 12), and females showed a higher effectiveness of shocking warnings to reduce tobacco consumption of, 76%, 78%, and 43%, respectively with P < 0.05. This study suggests that pictorial warnings on cigarette packages are more likely to be noticed and rated as effective by Italian smokers. Female and younger smokers appear to be more involved by shock images. The jarring warnings also appear to be supporting those who want to quit smoking. This type of supportive information in Italy may become increasingly important for helping smokers to change their behavior. Please note: This article was published more than one year ago. The facts and conclusions presented may have since changed and may no longer be accurate. And “More information” links may no longer work. Questions about personal health should always be referred to a physician or other health care professional. WEDNESDAY, May 7, 2014 (HealthDay News) — The story of a 10-month-old boy rushed to a hospital after ingesting the refill liquid used in e-cigarettes spotlights an emerging safety issue, the doctors who treated him say. The child recovered. But the consequences of children accidently consuming the nicotine in these refill vials can easily become tragic, Dr. Robert Bassett, of Einstein Medical Center in Philadelphia, and two colleagues report in the May 7 issue of the New England Journal of Medicine. Just “one teaspoon of a 1.8 percent nicotine solution could be lethal” to a 200-pound person, the doctors pointed out. The recent rise in such poisonings among children, tied to the surging popularity of e-cigarettes, highlights “the need to educate patients and parents about this danger and advocate for measures that will help prevent potentially fatal liquid nicotine poisoning of infants and young children,” the physicians said. The Philadelphia case report is hardly an isolated one, experts note. In April, the U.S. Centers for Disease Control and Prevention warned that the number of calls to poison control centers for nicotine poisoning from e-cigarettes has risen dramatically in recent years. Calls related to poisoning from the liquid nicotine used in e-cigarettes ran at a rate of roughly one a month in 2010, but jumped to 215 in February of this year alone. Even more troubling, more than half (51 percent) of the poison calls involved children aged 5 and younger, while 42 percent involved people aged 20 and older, the CDC said. “We have not had an unintentional poisoning death from e-cigarettes yet in the United States that we know of, but the potential is there given the amount of concentrated nicotine in these solutions — it would not take a lot for a child death to occur,” Dr. Tim McAfee, director of the CDC’s Office on Smoking and Health, said at the time. In the Philadelphia case, Bassett and his colleagues said the boy was taken to the hospital after ingesting a “small” amount of e-liquid nicotine bought at a commercial vaping (or “vape”) shop. The liquid contained 1.8 percent nicotine as well as “unknown concentrations” of other chemicals. After drinking the toxic liquid, the boy began vomiting, his heart rate sped up, and he exhibited loss of muscle control, the doctors reported. The 10-month-old was lucky, however, because he never lost consciousness and his symptoms gradually subsided about six hours after first being admitted to the hospital. But the physicians who treated him said the case raises troubling issues. “The [U.S.] Food and Drug Administration does not currently regulate nontherapeutic nicotine; this raises concerns that in the ballooning unregulated liquid nicotine market there may be variability in nicotine dosing and introduction of unintended toxic ingredients,” they wrote. There’s also a lack of consistent package labeling or child-protective packaging, the doctors noted. Many of the refill vials carry colorful labeling, “suggestions of edible ingredients [‘lemonade’],” and even “visually appealing cartoons” that might attract a child’s curiosity, Bassett’s team said. Speaking at the time of the CDC’s warning, experts agreed that the danger to children from e-cigarette refills is real. The CDC’s McAfee noted that the U.S. Food and Drug Administration is planning to propose regulations for e-cigarettes. He added that he hopes these regulations will include how the product is packaged, including childproof caps and warning labels. “These things can be hardwired into these products, rather than being left to the whim of the manufacturer,” he said. Poisoning from the liquid nicotine in e-cigarettes can happen in one of three ways: by swallowing it; inhaling it, or absorbing it through the skin or membranes in the mouth and lips or eyes, McAfee said. Once it is in a person’s system, nicotine can cause nausea, vomiting or seizures. If those symptoms occur, the patient will typically be told to go straight to the emergency room, said Amy Hanoian-Fontana, from the Connecticut Poison Control Center. If there are no symptoms, then the patient will be told to stay home and the center will call again in a few hours to see how the patient is doing. If liquid nicotine was spilled on the skin, the person should wash his or her skin in lukewarm water for about 20 minutes, Hanoian-Fontana added.